The famous French general, Louis de Bourbon, the Prince of Condé, was born on 8 September 1621. His father, Henri de Bourbon, first cousin once removed to King Henry IV, demanded his son have a proper education. Louis spent six years at the Jesuits' school at Bourges, where he studied history, law, and mathematics. After completing his studies at Bourges, he went on to study at the Royal Academy in Paris. At the young age of 17 Louis began to display talent for leadership. While his father was absent from home, Louis managed to govern Burgundy successfully. It was about this time that young Louis' personal life became somewhat complicated. His father had betrothed him to the 13 year old, Claire-Clémence de Maillé-Brézé, niece of the powerful Cardinal Richelieu, chief minister of the king. The problem was Louis was in love with someone else, a woman named Marthe Poussard (mademoiselle du Vigean), daughter of the king's gentleman of the bedchamber. Despite this, Louis' father forced him to marry the thirteen year old girl. Even though his young wife bore him three children, he accused her of multiple infidelities and had her locked away at Châteauroux. These charges were in all likelihood false, and merely a way of ridding himself of a woman he didn't love. By the time of the Thirty Years War in 1643, Louis was already a combat veteran. But at the Battle of Rocroi on the 19 May, he excelled himself against Spanish generals with far greater experience. After a resounding victory, he returned to Paris a hero. But the woes of that annoying marriage continued. It seemed the only respite from this situation was returning to the battlefront. In 1644, he went to Germany and he was again victorious in the Battle of Frieburg. 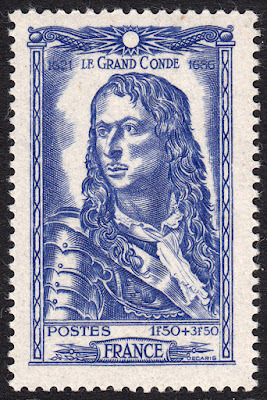 On 31 July 1944 France issued a set of six semi-postal stamps commemorating 17th Century French celebrities. Each stamp has a surcharge that contributed to national aid. One of these stamps features Louis as The Grand Condé. 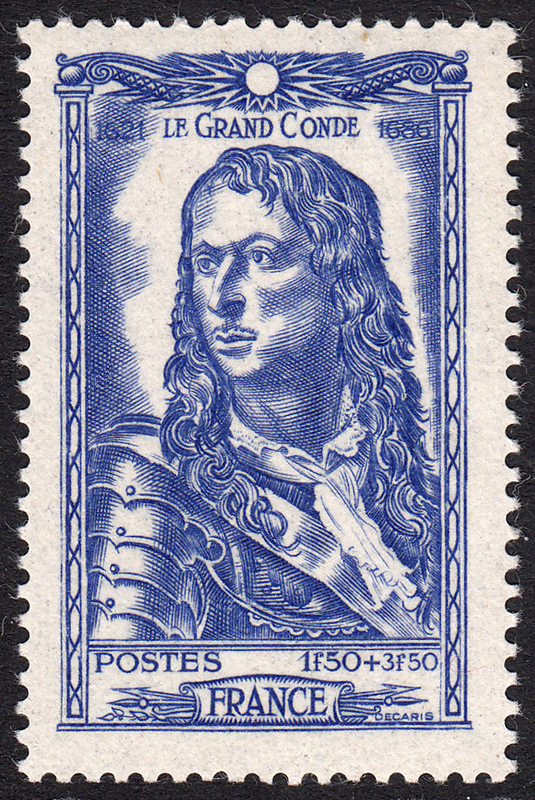 The stamp was designed and engraved by Albert Decaris. There are a few features in this design that I really like. Decaris has rendered the armour on Louis' right (our left) arm beautifully. I also like the delicate feel Decaris has given to the neck scarf. One final feature I like is the quiver-like country nameplate. A nice suggestion of the subject's military prowess.